From its modelling to its working then from cutting to assembly, each leather part has followed exactly the same ritual of mineral and vegetable tanning as Berluti shoes. 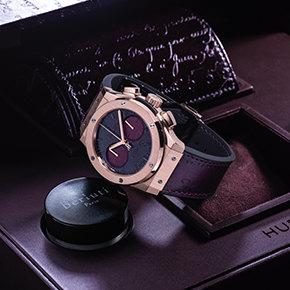 An additional challenge for the manufacture Hublot was how to use a living material in the sealed casing of a watch. 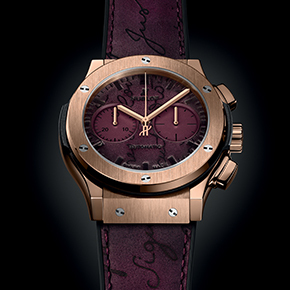 Hublot and Berluti rose to the challenge and through a complex and delicate process, the humidity that is contained naturally in the leather was neutralised, so that the Venezia Scritto could be encapsulated in sapphire. 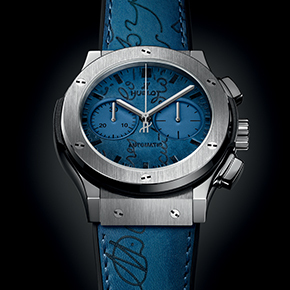 Leather that has been made unspoilable, protected from any oxidation. 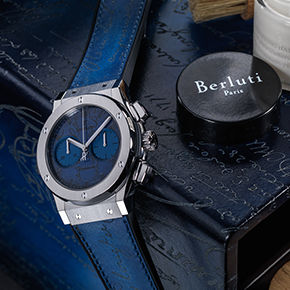 Hublot x Berluti, timeless materials.